Euronext offers a comprehensive suite of corporate actions data products that are delivered via its brand new distribution platform – the Euronext Corporate Actions Portal. Developed as part of Euronext’s efforts to continuously enhance and modernise its data products offering, the Euronext Corporate Actions Portal provides real-time delivery of valuable corporate actions data via a convenient user-friendly interface. It allows customers to mitigate risk by aggregating all data, including back-history information, in a single feature-rich environment, offering an enhanced user experience and greater efficiencies. Provides corporate actions, dividend and other notices for Euronext Amsterdam, Brussels, Lisbon, London and Paris-listed securities. The notices are provided in real time in PDF format and every hour in XML, XLS and TXT format, which is available as an ancillary subscription. 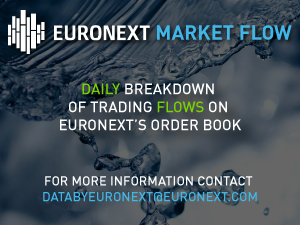 Provides a daily report that carries an overview of all corporate actions and dividends that will impact the order book of Euronext Amsterdam, Brussels, Lisbon, London and Paris-listed securities on the next business day. Provides general notices and corporate actions notices for contracts listed/traded on Euronext Amsterdam, Brussels, Lisbon and Paris derivatives markets. The notices are provided in real time in PDF format. Provides reports carrying index review information and any corporate actions, divisor changes and dividends paid one day in advance. The product details all the corporate actions to the constituents of the indices including additions, deletions, ex dividend adjustments and changes arising from a variety of corporate events to be applied the next business day. The product also provides reports with upcoming changes & corporate actions impacting the constituents of the indices after the next business day. Index review information is also included in this product. To request additional information or subscribe to the Euronext corporate actions products please contact the Euronext Licensing Department.